23andMe released a new health report this week, and it's quite a bit different from the other types of reports they've released in the past. Most conditions that affect people (like type 2 diabetes) are complex in origin, meaning that even if it's "genetic," it's not necessarily easily-tested by DNA. This is due to reasons such as polygenic factors being influenced by environmental factors (diet, smoking, exercise, etc.). Polygenic refers to the fact that there can be dozens - if not hundreds or THOUSANDS - of genetic factors involved, each one having only a tiny impact on overall risk. This is what you'll eventually see if you keep scrolling down your 23andMe report, and it's important to read and understand these things before you take anything away from your diabetes risk as reported by 23andMe. It’s important to know what a DNA test can’t tell you, as much as what it can. Here’s the list of limitations you’ll see if you keep scrolling down your 23andMe report. Interested in reading more about this topic? This article in MIT Technology Review brings some good points to the discussion. This article by Jeanette McCarthy on Precision Medicine Advisors reviews polygenic risk scores, including a section on why they are controversial and not everyone agrees they are ready for prime time. This article on the International Society of Genetic Genealogy wiki gives a good introduction to polygenic risks scores as well and is written by a PRS researcher. If you are looking for a licensed and certified genetic counselor’s help in understanding your report, reach out or schedule with me. I’ll be happy to go through it and answer your questions! Do you know or belong to a group who might like to have a certified genetic counselor speak about 23andMe or another particular topic related to at-home genetic testing? I have a part-time private practice specializing in at-home testing and am available to give this type of live video chat to your group. June is Alzheimer's Awareness month which seems an appropriate time for an updated post on Alzheimer's disease. I've compiled resources about Alzheimer's disease genetic testing into one place (see the bottom of this post). I'm also including some direction on how to involve a genetic counselor when you prepare to open your 23andMe report on late-onset Alzheimer's disease risk (or a third-party report run on a raw data file, like Promethease). Panic doesn't have to be part of the equation if you find out you have an elevated risk of developing Alzheimer's disease. The advice and resources included below can help reduce or stop the panic before it has a chance to start. If you haven't worked with a genetic counselor before, a genetic counselor is a great partner to have when you are deciding to have DNA testing or at the point of learning DNA results that could have a profound effect on your outlook for the future. I can speak for all genetic counselors when I say we aren't trying to keep you from your genetic information. We aren't trying to meddle with your rights or get between you and knowledge about yourself. Genetic counselors know you can handle what you find out. It's our job to get you the correct information and help you locate support you when you need it. After your results are back but before you open your Alzheimer's risk report, consider finding a genetic counselor to have on call. 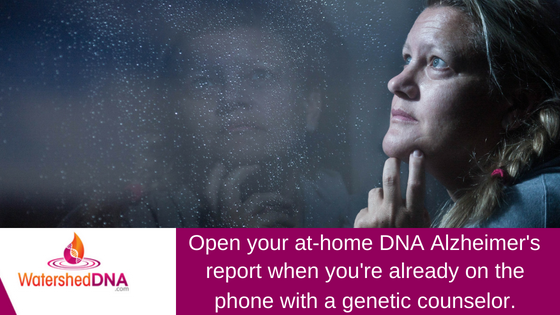 Schedule an appointment with them*, and open your report together with your genetic counselor on the phone or over video chat. *Ways to do that include scheduling with me here or someone else in the Genome Medical network here* or searching for someone located near you here. Watershed DNA and Genome Medical services available only to U.S. residents at this time. You'll have instant access to information, support, and next-steps if you find out you carry an elevated risk of late-onset Alzheimer's disease. If you find out your risk does not appear to be elevated, you can use the rest of the time with your genetic counselor to review your family and personal medical history. Your genetic counselor can explain other types of testing that might fit your needs. It might be carrier screening if you're planning a family, or a proactive genetic screen if you're healthy but curious about future risks. Diagnostic testing might be what you need if you already have a medical condition or health symptoms. A one-time appointment with a genetic counselor -- whether you're having unexplained medical issues or are healthy without any specific genetic concerns -- can set you on the right path. At-home DNA tests merely skim the surface. Find a genetic counselor to be your partner, and keep learning about the different tests available. Some DNA tests are medical-grade and some are not, so make sure you've taken the right one. Learning about your genetic risks can be empowering if you know what to do with the information you learn. Your Alzheimer's risk report might be ready and waiting for you, but don't feel pressured to open it right away. Read some of these articles, then look for a genetic counselor to have on the line, if it feels right to you. Watershed DNA blog post: Should you do a home DNA test for Alzheimer's? Watershed DNA blog post: Need help fighting the urge to open your Alzheimer's disease risk report? apoe4.info article: Thinking about testing? APOE4.info is a support organization founded and operated by individuals who have found out they carry an elevated risk of Alzheimer's disease based on genetic results. Not all of the content on the site has been developed or reviewed by medical/genetics providers and researchers. Check with your doctor before you make changes based on what you read on the site. Readers who are in the age range of 60-75 years old, you have a chance to help make a difference for your children and grandchildren by enrolling in the Generation Program. There are some particular criteria for participants, so read more here to find out if you're eligible. Click here to schedule your session with Brianne Kirkpatrick, MS, LCGC. If you’ve seen a television commercial about DNA testing and thought about ordering a kit for yourself, you aren’t alone. DNA tests, once confined to paternity courts, forensics labs, and medical clinics, are now available for purchase at the drug store or online. The number of tests climbs by the year along with the uses. 23andMe now provides FDA-approved reports on Parkinson's disease risk, and I thought readers could benefit from a post specific to the condition. This guest post was written by my friend and former colleague, Lola Cook Shukla, who specializes in the genetics of Parkinson's disease. Lola is a genetic counselor who provides telephone genetic counseling to participants who are part of a large Parkinson’s disease research study, sponsored by the Michael J. Fox Foundation. The wing of the study focused on Parkinson’s genetic testing is located at Indiana University School of Medicine. Thank you, Lola, for sharing your expertise with us! There's a lot of nuance to the risk of developing Parkinson's, and I appreciate the chance you've given us to understand it better. The company 23andMe began again to offer genetic testing for specific health risks in 2017, including Parkinson’s disease. Parkinson’s disease is a common adult-onset movement disorder. Genetic testing may tell you that you have an increased risk for developing Parkinson’s disease; however, it cannot tell you for sure if you will or will not get the disorder. In other words, regardless of your genetic test results, you may or may not develop Parkinson’s disease in your lifetime. It is a chronic and progressive movement disorder. About 1-2% of all people will develop Parkinson’s disease in their lifetimes. The average age of onset for the most common type is age 60. Dopamine deficiency causes Parkinson’s features which include slow movement, rigidity of the muscles, tremor, and gait problems. Other features may include changes in the ability to smell, cognitive and psychiatric symptoms, sleep disorders, pain, and fatigue. Parkinson’s disease was previously thought to be caused mainly by environmental factors, but research now indicates that in most cases the disease develops from a complicated interplay of genetics and environment. 23andMe’s test screens for changes (variants) in two genes, LRRK2 and GBA. However, there are additional variants in LRRK2 and GBA, and other genes, that 23andMe doesn’t test for that are likely involved in the development of Parkinson’s. It is difficult to check for these other changes either because they are infrequent or have unclear significance. In addition, it becomes more expensive to test for more rare and subtle changes. Some environmental factors that have been implicated include severe head trauma, chemical exposures such as pesticides, and infectious agents. There are also possible protective factors. Caffeine use and moderate to vigorous exercise might be protective, so drinking your coffee while briskly walking may be healthy steps you can take to keep Parkinson’s at bay! Ethnicity and family history influence a person’s chances. Having Ashkenazi (Eastern European) Jewish background increases the chance of carrying a change in LRRK2 and GBA - so does having more than one relative in the family with the disorder. It is reassuring to know that the majority of individuals with a genetic risk variant will never develop the disorder since LRRK2 and GBA variants need other factors to cause their expression. Keep in mind that regardless of a genetic result there remains a baseline risk of developing Parkinson’s for everyone. Although a risk may be provided by a genetic test report, this is only an estimate and does not take into account personal factors that could impact risk. Researchers are very interested in knowing why some people with these risk variants develop Parkinson disease, and others do not. When individuals decide to have genetic testing for Parkinson’s disease, they may inadvertently learn that other relatives have a risk as well. For example, carrying a variant associated with PD often means one or the other parent has it as well. It could also mean children, siblings, aunts, uncles, and cousins may have the variant, too. Not everyone wants to know if they carry a genetic risk for which there is no clear and effective treatment to slow or prevent the disease at this point in time. This genetic risk could be information that other family members may or may not want to know, which is something to consider if you test yourself. Genetic disorders in general are often a family affair with a family member’s risk rippling out to others. This can be seen as helpful news or unwelcome news from one person to the next. Another interesting aspect of testing for Parkinson’s disease is that variants in the GBA gene are not just associated with Parkinson’s but also a very different disorder – Gaucher disease. Gaucher disease is a metabolic disorder often manifesting in childhood, which can vary in severity. Possessing one or two copies of a GBA variant is a risk factor for Parkinson’s whereas carrying two GBA variants (the one you get from your father and the one you get from your mother) causes Gaucher disease. Persons who carry one GBA variant do not have Gaucher disease, but have the potential to have a child with Gaucher disease if two variants are passed on. This means that finding out if one carries a GBA mutation may also have implications for pregnancy and family planning. 23andMe reports on more GBA variants in your Gaucher disease report than they include on your Parkinson’s disease risk report at this point in time. This means your report - and therefore your understanding of your risk for PD - may change over time. If you’d want to know if you have an increased Parkinson’s disease risk, make sure to pay attention to update emails 23andMe sends you. Why Do Healthy People Choose to Test for Parkinson’s Disease Risk? It is important to think carefully about the potential implications of testing before doing it. It may be beneficial to speak to a genetic counselor, a trained professional who helps individuals better understand the benefits and limitations of a particular genetic test, before and/or after testing. Individuals who are interested in being part of a Parkinson’s disease research study may consider joining the Parkinson’s Progression Markers Initiative (PPMI). This study, offered through the Michael J. Fox Foundation, aims to identify biomarkers (physical indicators) of PD by enrolling individuals with a genetic predisposition to the disease into an observational research study. Typical requirements for the study include: Jewish heritage and having Parkinson’s disease or a first-degree relative with the disorder, or knowledge of carrying a LRRK2 or GBA change. Other places to search for Parkinson’s research studies and clinical trials are www.clinicaltrials.gov or in the "Get Involved" tab on the Michael J. Fox Foundation’s website. Need help fighting the urge to open your Alzheimer's disease risk report? Fighting the urge to find out your APOE status from a 23andMe genetic risk report is impossible for some. Even with multiple layers of warnings a customer goes through to be able to view the report, it's easy to click boxes and breeze through to your report in less than a minute. But if you have no symptoms of Alzheimer's disease, the American College of Medical Genetics and Genomics wants you to think twice before checking on your APOE gene status. APOE is associated with (but not causative for) Alzheimer's disease for some people. 40% of people with the version of the APOE gene associated with Alzheimer's will live their entire lives asymptomatic. A few years ago, ACMG partnered with the Choosing Wisely campaign to offer directiveness on genetic testing of the APOE gene. The ACMG assessment offers links to references that support their stance that doing predictive testing for Alzheimer's disease in someone without symptoms is, well, NOT WISE. My job as a genetic counselor isn't to tell people whether they are being wise or unwise. My job is to offer the options, to share what we currently do and do not know about genetic disease risk associations, to connect my clients with resources for more support and learning, and to guide them in making a decision that is right for them, at least right now. What we know now about the genetics of Alzheimer's disease is limited, and interventions like treatments and drugs are heavily researched but so far not highly promising. Would you want to know you carry an association that many in the world do, that in many cases never results in the development of Alzheimer's disease? It's a tough choice. A genetic counselor can help you think through these things. Maybe fighting the urge to open certain reports is what you need right now. Alzheimer's disease is a complex and devastating condition. Genetic factors are only one piece of puzzle, as today's post will explain. This guest blog post is written by Jamie Fong. Jamie is a board certified and licensed genetic counselor. She provides genetic counseling to people and families with or at risk for inherited neurodegenerative disease, including Alzheimer’s disease, frontotemporal dementia, prion disease, Huntington’s disease, amytrophic lateral sclerosis, and ataxia. I'm grateful for Jamie taking the time to highlight the key points for my readers. The points she makes in #11 and #12 are especially helpful: you can participate and contribute to active research on Alzheimer's disease, and you can find a genetic counselor near you specializing in risk assessment for the condition. In April, the direct to consumer test company 23andMe announced it received FDA approval to offer testing for 10 genetic risk factors. Each of the 10 genetic risk factors is associated with a particular health condition. Alzheimer’s disease is one of these conditions. That a genetic risk factor associated with Alzheimer’s disease is among the tests included in 23andMe’s Genetic Health Risk Report is no surprise, as Alzheimer’s disease has considerable impact on our society. This is reflected by the large (and growing) number of people with the condition as well as by the skyrocketing number of caregiving hours devoted to and healthcare dollars spent on patients. Alzheimer’s disease appears to rank among the most popular conditions for which people seek direct to consumer genetic testing. From 2011 to 2013, 23andMe previously offered genetic testing for Alzheimer’s disease. At the request of the FDA in 2013, the company stopped offering it, and the recent announcement heralds the test’s relaunch. You may have questions about 23andMe’s Alzheimer’s disease test or about what test results mean. The following are some points to consider. 1. Everyone has a chance to develop Alzheimer’s disease, a progressive brain disorder that affects memory and thinking. Age is the biggest risk factor for developing the condition. A person’s chance to develop Alzheimer’s disease increases with age. 2. 23andMe’s genetic test for Alzheimer’s disease determines the chance (or risk) of getting Alzheimer’s disease. The test cannot tell a person whether or not he will definitely develop the condition. 3. 23andMe’s genetic test for Alzheimer’s disease looks at a gene called APOE. ApoE occurs in 3 different versions. Another way to think about this is that ApoE comes in 3 different flavors. Each person carries 2 flavors, which can be the same 2 flavors or different 2 flavors. Only one flavor of ApoE is associated with increased chance to develop Alzheimer’s disease. This is known as the Alzheimer’s risk variant (or flavor), called “E4.” The other variants (or flavors) are not associated with increased chance to develop Alzheimer’s disease. 4. The effects of having an “E4” variant of ApoE depend on a person’s ethnic background. Among people of European ancestry, having one or 2 “E4” variants of ApoE is associated with increased chance to develop Alzheimer’s disease in his lifetime. However, it is not a certainty that a person with an “E4” variant will get sick. 5. The "E4" variant is common. About 20% of people with European ancestry have one “E4” variant of ApoE. About 3% of people with European ancestry have 2 “E4” variants. 6. People with African American ancestry are more likely than people with European ancestry to have an “E4” variant of ApoE. By comparison, people with Mexican American ancestry are less likely to have an “E4” variant. However, African Americans and Mexican Americans have a greater chance to develop Alzheimer’s disease than people of European ancestry, regardless of which ApoE version they have. Other genetic and socioeconomic factors likely play a role in these differences. This highlights our incomplete understanding of the genetics of Alzheimer’s disease among people with non-European ancestry. 7. A person who has no “E4” variants of ApoE may still be at risk to develop Alzheimer’s disease. In the absence of an “E4” variant, family history of Alzheimer’s disease may be the most helpful tool in determining a person’s chance to develop the condition. 8. The “E4” variant of ApoE is not the only genetic variant that contributes to Alzheimer’s disease risk. There are numerous other genetic variants involved in increasing a person’s chance to develop the condition. Some of these variants are known by researchers and clinicians, but many have not yet been discovered. 23andMe’s genetic test looks at none of the other Alzheimer’s disease risk variants. 9. Whether you have 0, 1, or 2 “E4” variants of ApoE, your doctor’s advice to you is constant. This means that your doctor’s recommendations do not depend on your 23andMe’s genetic test result. A heart healthy diet and regular cardiovascular exercise may reduce a person’s risk to develop Alzheimer’s disease. Be wary of claims of the benefits of dietary supplements and/or brain games. Nothing has been proven to prevent Alzheimer’s disease altogether. 10. 23andMe’s APOE test should not be used to confirm or rule out a diagnosis of Alzheimer’s disease. The condition is diagnosed by a multitude of other non-genetic tests. If you are concerned about symptoms, please consult your doctor. 11. There is hope for Alzheimer’s disease therapies in the near future. Consider participation in research. Check out www.endalznow.org. 12. If you have questions or want a tailored risk assessment, contact a genetic counselor or other genetics professional. Check out the “Find a Genetic Counselor” feature on www.nsgc.org. Written by Jamie Fong, a board certified and licensed genetic counselor. She works with a multidisciplinary team of neurologists and neuropsychologists at the UCSF Memory and Aging Center, where she is involved in both the Center’s clinic and research programs. Jamie holds a Bachelor’s degree in Molecular and Cell Biology from UC Berkeley, and a Master’s degree in Genetic Counseling from Sarah Lawrence College. 23andMe Genetic Health Risk Reports - An April Surprise! 23andMe is a personal genomics company offering reports on a number of different types of DNA findings. They use a specific type of DNA test called a SNP ("snip") microarray. A SNP test doesn't include testing for your entire genetic code, just a tiny portion of it. I think we can expect the list to grow longer over time. If you're planning to order a 23andMe test (or if you've already ordered one in the past and will open your new reports when available), spend a little time learning about these conditions beforehand and how the information might help you. I understand this test cannot DIAGNOSE me with any of these conditions, rather they show that my chances for developing them may go up or down. I understand there are online resources, including reliable websites and support groups, that can help me if my report shows the presence of a genetic variant for one or more of these conditions. I understand sometimes genetic technologies, and the people running them and interpreting the data, can make mistakes. I am the same person with the same DNA that I was yesterday. Nothing about me changes solely based on a DNA test. I understand genetic counselors want to partner with DNA test takers to help them understand and adjust to their results and I can find one through various sources including findageneticcounselor.com, Genome Medical, and Watershed DNA. * I will be adding more resource and support websites to this blog post and the resources section of my website over time. If you ordered a 23andMe test that includes the FDA-approved health reports, and you haven't opened them up to look yet, you need to. Here's why! 1. Looking at the results will not "curse" you. This sounds silly but it is something I have heard people say. What's there is there, and the act of opening a report will not change this. Knowledge is power! Let the reports begin to empower you with your health information. 2. The reports do not diagnose you with medical conditions. 23andMe's FDA-approved reports tell you about being a "carrier" for a limited list of recessive conditions. These are conditions your children may develop if you and partner are both carriers. It is not a complete test of all carrier conditions (a clinical test is need for full screening), but it's a partial list of some of the more common genetic variants. 3. If you are found to be a carrier of a condition on 23andMe's current list (and many people are), this information is important for you AND your family members. If you're a carrier, so too may be your children, your siblings, your nieces, nephews, cousins, and other relatives. Knowing if a recessive condition is passing through a family helps potential parents get early information. Infants benefit from early diagnosis, support, and care. Parents benefit from knowing early, allowing them to plan prior to conceiving a pregnancy or to help their child receive a diagnosis and benefit from services and medical care right away. For support before or after 23andMe testing, reach out to Brianne at Watershed DNA.